We are a prominent Manufacturer and Supplier of FRP Gratings. These FRP Gratings are manufactured from high strength fiberglass and premium polyester resin. The FRP Gratings offered by us are better than the conventional steel gratings, owing to their quality and longer life. Our range of FRP Gratings includes FRP Molded Grating, and FRP Pultruded Grating. 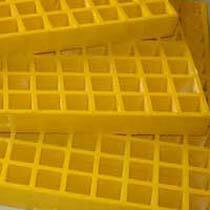 This range of FRP Grating is greatly used in vast industries and processes.